“Intoxicated by the Moon”. 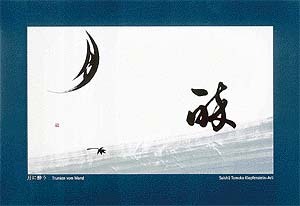 Contemporary calligraphic panel by Suishu Tomoko. A card of invitation to two events centring upon the work of two contemporary Japanese calligraphers came in the other day, and the sheer beauty of the examples reproduced in it served – as works of art do – as reminders. Reminders of a world that we in India know so very little of, and seldom enter. Calligraphy – ‘the art of beautiful writing’ – is not something that occupies any significant space in our minds. There is, to be sure, fine calligraphy in Arabic to be seen on some of our medieval monuments; an occasional panel or manuscript, written not only with care but feeling, in our own native scripts, turns up sometimes; one even knows of some early Indian texts that speak of the art of fine writing. But, the beauty of calligraphy rarely, if ever, ignites even the more sensitive among Indian minds. Further towards the East, however – in Japan, above all – things are vastly different. There, calligraphy – "sho" – has a distinct, exalted place in the hearts of men and women. Seen as being possessed of an almost mystic power as it is, it gets related to Zen Buddhism on the one hand, and to the tea ceremony and Ikebana and Haiku poetry on the other hand: things that are quintessentially Japanese. Calligraphy, for its practitioners, is an art of the spirit, something that comes from the world of stillness within. There are, of course, as there have always been, great, nationally acknowledged, masters of the art, but even a school-going child in Japan knows something about calligraphy. Without much hesitation, he or she would be able to tell what kaisho, the square style that came from China, is like, or the other four basic styles: tensho, the oldest, now used mostly for personal seals; reisho, a variant of tensho and elaborated upon by monks; gyosho, which is semi-cursive; sosho, cursive, literally "grass writing"; and, of course, kana, the style which especially suits Japanese characters. Everyone, or almost everyone, would know something of the history of calligraphy: how it came to Japan initially from China, how, in the 7th century or thereabouts, a Japanese style came to be formed, and how, gradually, it moved out of the imperial circle and into the lives of ordinary men and women. Each year, on the 2nd day of New Year, is held the kakizome – "first writing of the Year" – in which whole groups participate, writing felicitous words or phrases, while seated facing in a chosen, auspicious direction. Powers are invoked; poetry is allowed to flow in. To be aware of all this can be the beginning of understanding, slowly, why Japanese calligraphy is so often referred to as ‘writing from the heart’. For what one speaks of here is not merely skill but also imagination. As has been well observed, in the West, writing was intended to be uniform, standardised; in Japan, the aim of it was to bring words to life, endow them with character. That is why styles tended to be so individual, varying from person to person. It is not easy for the uninitiated to understand the complexity involved in calligraphy, for it seems to be completed in a matter of seconds. But when one regards the fact that the characters, however complicated, must be written only once – there is no altering, touching up, or adding to them afterwards – one starts getting some idea of all that it involves. As always, and everywhere else, there are rules and conventions that govern writing. One must bear in mind, for instance, the natural balance in both the characters and the composition as a whole; the straight lines must be strong and clear; the curved lines must be both delicate and fluid; the thickness must be varied; the amount of ink or lack of it on the brush – always, a brush (fude) is involved, not a reed pen – must remain consistent throughout; the size of the characters must be of a scale that gives life to the work; there must be a rhythm in the whole work. Then there are other considerations. In a traditional piece, thus, there must be at least one blotted area (nijimi), and one patchy area (kasure); at the same time, two blotted characters cannot be next to each other. And so on. One can see that it is all both formalised and exact. But, there is also great freedom that the artist claims for himself. To take an example, while writing a long poem on a sheet, the calligrapher can begin the lines of the poem at different levels on the paper to portray the rhythm of the verse, or write in darker and lighter shades of ink to give a sense of depth to the words, making the work look almost like a landscape painting. In the final analysis, the aim is to free oneself of all rigidities and constraints, and to soar, as it were. That is if you regard art as the finger that points to the absolute, as the Masters say. The beginnings of calligraphy in Japan are said to have an Indian connection, however indirect. It was Buddhism that inspired it. That great religion had travelled to the land from India via China and Korea and was making many converts, including the Emperors. But Buddhist scriptures, all scripted by monks and aesthetically most pleasing, were all recorded in Chinese writing. Inspired by, and in emulation of these, the Japanese developed calligraphy of their own, somewhere in the seventh century, as most accounts agree. Almost mythical powers were attributed to great masters of calligraphy in the past, something that has an almost Indian ring to it. The great Kukai is thus said to have been asked by a Japanese emperor once to rewrite – rapidly – a section of a badly damaged five-panelled screen. Kukai is said to have picked up a brush in each hand, gripped one between the toes of each foot, placed another between his teeth, and set about writing five columns of verse simultaneously! Absorbing tale, this, even if not worthy of serious credence.